This design is focused on celebrating the achievements of Amy Johnson and the step forward for women’s equality. It is inspired by the inspirational wartime poster, ‘We can do it!’, which was used to highlight women in the work place. 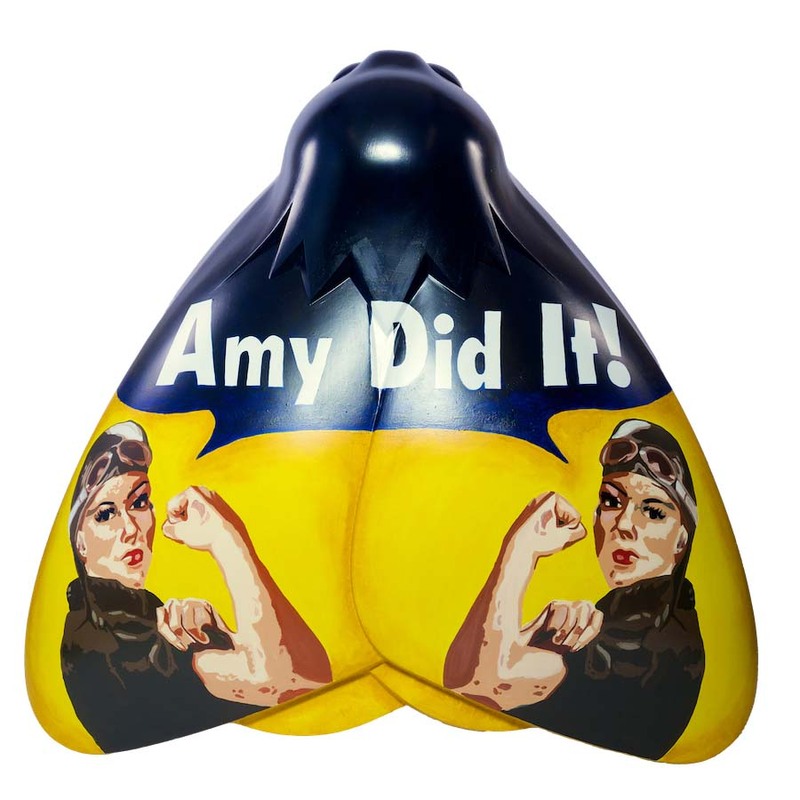 The poster has been adapted to resemble Amy by dressing the female figure in aviation headgear and a jacket, symbolising her positive role in women’s equality. The slogan now reads ‘Amy did it!’ to celebrate being the first woman to fly solo from England to Australia, and how much she achieved in her lifetime. The Birmingham-based artists Kieron Reilly and Lynsey Brecknell have collaborated to bring their design to the Amy Johnson Festival. Lynsey is currently working as a scenic implementation assistant for a theatre company. She has experience as a prop maker, set designer and dresser. Kieron is a skilled digital artist and model maker and is currently working as a production technician. Humberside Engineering Training Association (HETA) is a non-profit organisation which works to bridge the gap between industry and education. HETA is renowned as the leading provider of engineering training in the region, offering advanced apprenticeships in a range of areas. By supporting the Amy Johnson Festival, HETA hopes to inspire the next generation of female engineers.